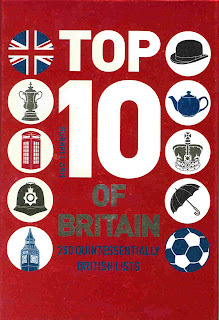 Top 10 Food and Drink Brands in the U.K.
As you can see, there are a large variety of topics covered in the book. Some of the lists are presented in straight list format, such as the "Top 10 Oldest Universities in the UK" while others have interesting explanations provided for each entrant on the list ("10 Sports and Games Invented in Britain"). My only criticism of the book is that it is so fascinating and readable that before you know it, you've finished it! More, please!